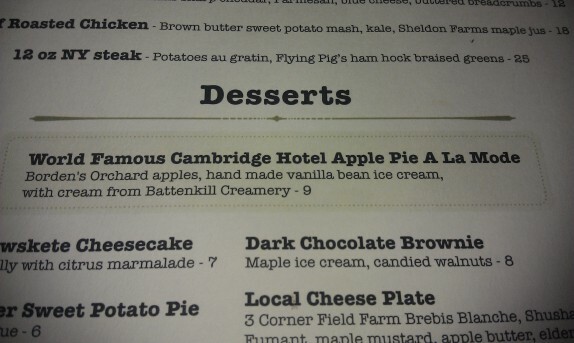 As you’re probably aware, my first visit to the Cambridge Hotel was to attend dinner service while Gordon Ramsay’s crew was taping. It was a surreal experience. While I didn’t get to see Gordon in action, I did get to see what it’s like when people are trying to get on television and when there are television cameras around. But, more importantly, I got to sample the menu in the restaurant before the makeover. It wasn’t pretty, and, I’m still eager to see the episode of Hotel Hell on Fox and Gordon’s reaction to the food. I called the hotel on the morning that I read Steve Barnes’s tale of the remake being “remarkable” to make a reservation to spend the night in one of the remade rooms and to dine in the restaurant; I felt that the venue would provide the perfect setting to take care of some personal business. 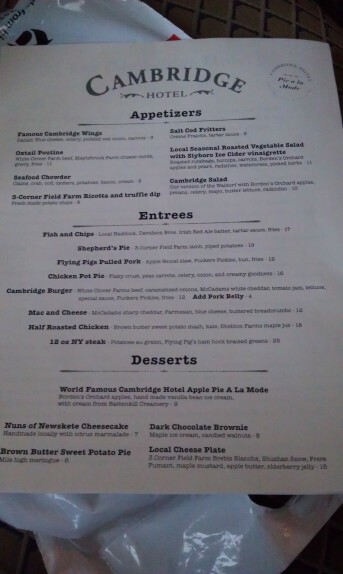 When I saw the menu after the makeover, I really didn’t find anything on the appetizers that interested me. 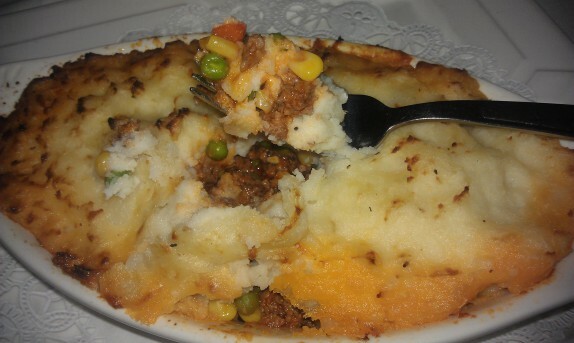 So, before the trip, I decided that all I was going to get was shepherd’s pie, since I’ve seen Gordon do this thousands of times, and apple pie a la mode, because I was certain that Gordon would overhaul this dish for them. 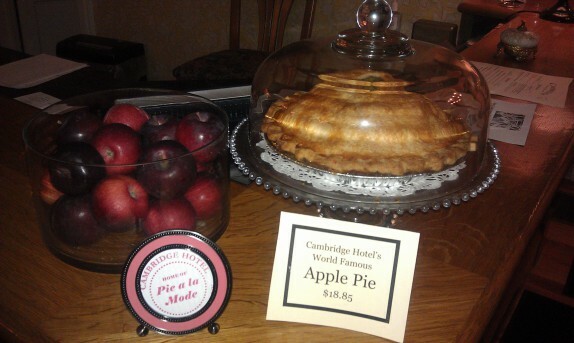 Where you check in, they proudly display apples and pie. 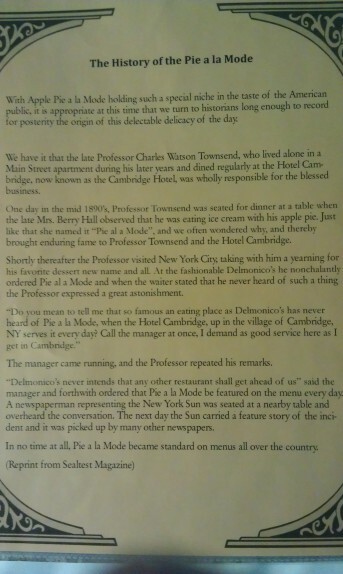 Actually, Cambridge Hotel is the alleged home of pie a la mode, and they proudly tell the story in the literature that is in the rooms. I was a little bummed that my favorite server ever was not there for service that evening, but I did run into her in the lobby and got to at least say hello. Since we were right upstairs, we arrived promptly for our 6PM reservation, and were seated immediately, at the same table where we sat on the first trip (my request). When seated for dinner, we were presented with menus clearly designed by Gordon’s team. 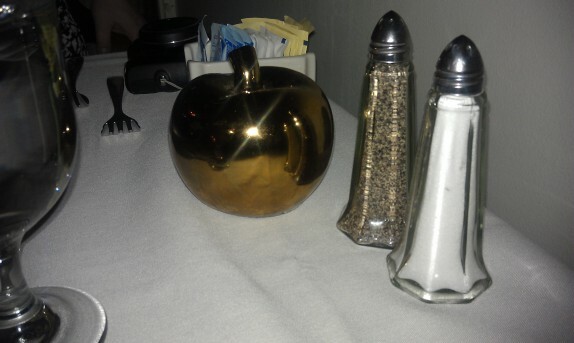 The table was set with a golden apple; it was a nice touch. We ordered a bottle of wine to celebrate the occasion. 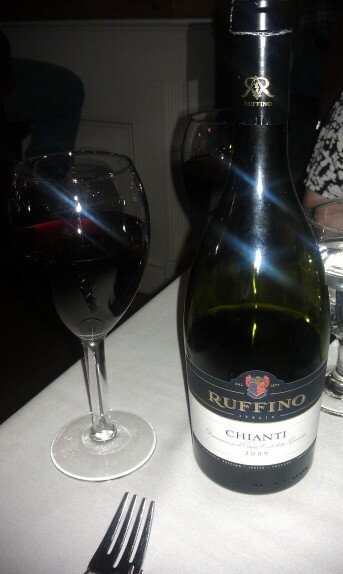 I settled on the Ruffino Chianti because it might pair nicely with the shepherd’s pie. 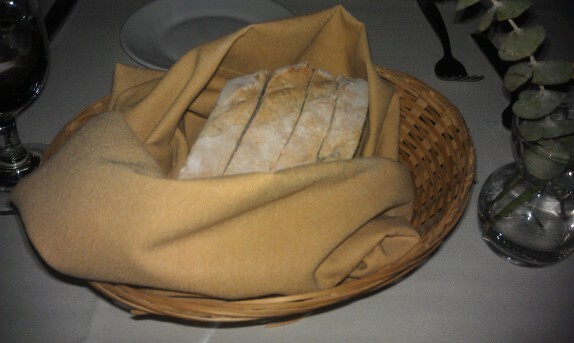 They quickly brought us some bread for the table. It was probably local stuff; I didn’t ask. I was busy overhearing a conversation. The conversation I overheard was one of the owners telling a customer that they had changed the recipe of the buffalo wings back to theirs after Ramsay left. The reason she was giving was that Ramsay’s wings “looked like they were boiled and tossed in red sauce.” That forced my hand. I ordered the wings as an appetizer. The wings were alright, nothing special. They were salty as all hell. There was a very bright spot on the plate, though. The blue cheese sauce, served in the steel contraption that looks like a miniature baseball helmet, was superb. It was a creamy and sumptuous dressing with crumbles of fresh Danish blue cheese on top. 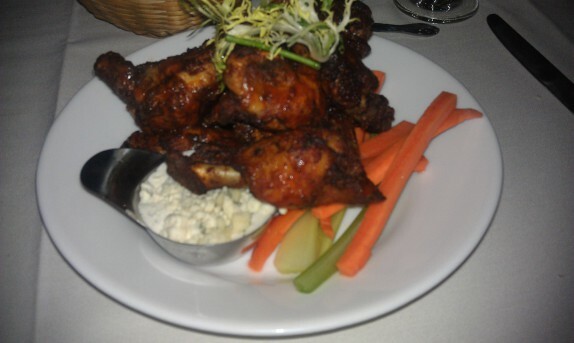 I seldom enjoy the blue cheese dressing with wings, but, here, I was impressed. As I was eating the wings, our entrees came. 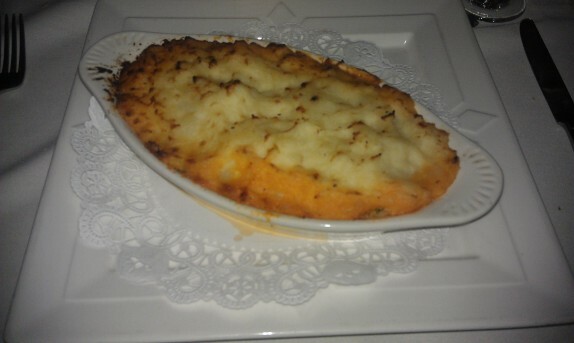 The shepherd’s pie was pretty good. There were some minor issues. The inconsistency of temperature within the pie made the center difficult to enjoy (because it was significantly colder than the rest), while the outer bites were very hot, but the flavors were nice. Having been familiar with some of the recipes I’ve seen Gordon make for shepherd’s pie, I was surprised to find peas and corn under the potatoes. It all tasted fine. The lamb itself was exquisite; the local products seem to make all the difference. It was a hell of a generous portion, too. As we were finishing up, the waitress took our dessert order. 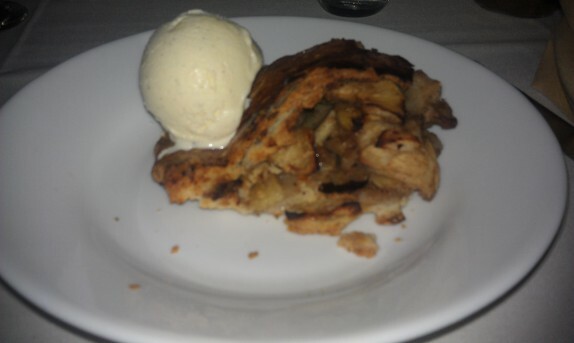 All I cared about was apple pie a la mode. My pie a la mode came quickly from the kitchen. When it was served to me, it appeared to be a bit of a disappointment. The side they presented to me had noticeably burnt edges and was non-uniform. The opposite side was cleanly cut. The crust was buttery and delicious. The filling, albeit on the dryer side, was a vast improvement from the first trip. I have on good authority that the apples are actually from Gordon Ramsay’s orchard, which is a cool fun fact. 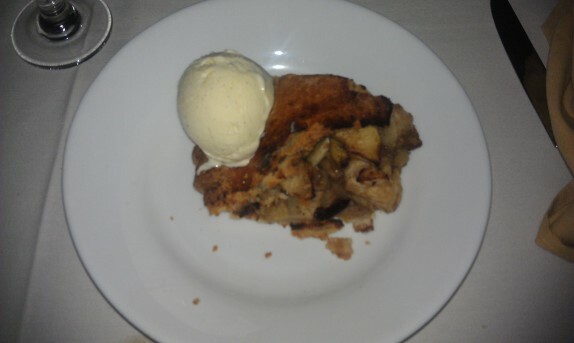 The ice cream, which is advertised as hand made with local cream, was delicious, not terribly sweet, but the perfect compliment to the warm pie. The check came, and dinner was over. It was 7:05PM. The pace of the meal was way faster than it needed to be. I’m sure that if Gordon were there, he’d be telling them, “it’s not a race.” It’s ok; it left us to enjoy the evening in our beautiful room with a balcony overlooking the lovely town of Cambridge. While the dinner overall wasn’t stellar, it was an improvement over the first trip. If the people in the kitchen keep their focus on showcasing the diverse and high quality ingredients available locally, they will win over a lot of people who would are looking for something special in a dining experience. They are blessed with such a special town and history that it would be a shame for this business to fail. 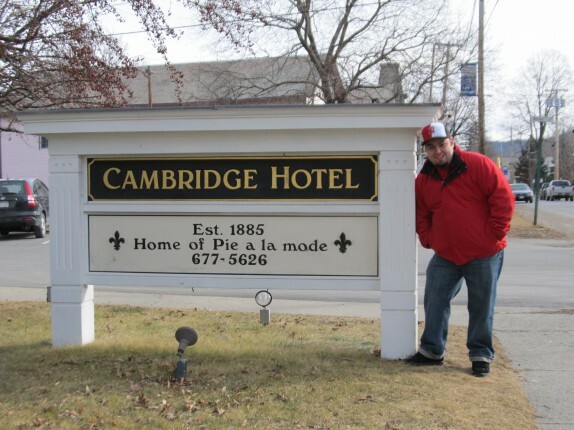 The Cambridge Hotel closed its doors on June 17, 2012. Gordon Ramsay’s influence was not enough to get the pendulum to swing in a positive direction for the people running it.